Devils Dance Floor is a unique name for a peak and is likewise unique as a ski tour destination that is known by few and visited in winter by fewer. The navigation and skiing challenges are great but the rewards upon reaching the summit are awesome. 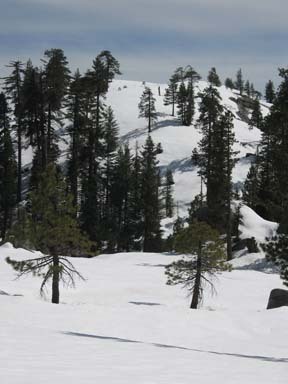 The source of at least part of the peak's name is obvious when viewing an image of the peak in summer — the summit is a giant granite dance floor. 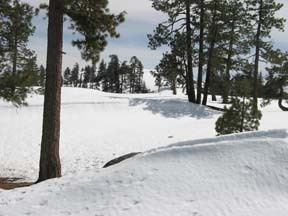 In winter it is covered by snow, but in spring part of the granite may be visible. Regardless, the size and flatness of the summit are unmistakable in winter. Devils Dance Floor in summer. Courtesy of Google Earth. Why the name refers to the devil makes no sense (it may have its roots in Native American culture) because it is more like heaven. 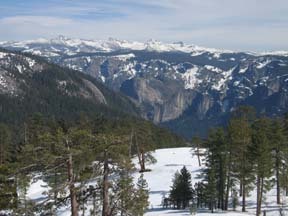 The panorama from the summit beats that of Dewey Point and challenges Glacier Point for shear beauty. The Clark Range stands out most prominent to the east. From left to right the peaks are Mount Clark, Gray Peak, Red Peak and Merced Peak. 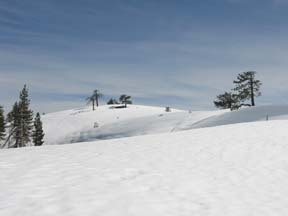 To the right of the Clark Range is a Horse Ridge near Ostrander Ski Hut. Also to the east, but closer at hand and below, is Yosemite Valley. A little farther south are the barren slopes of Badger Pass Ski Area. 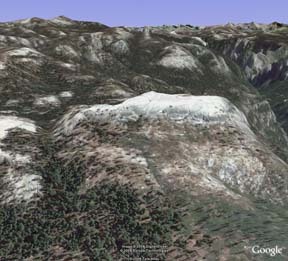 Follow Yosemite Valley to the west and you are looking at the Merced River canyon. Reaching Devils Dance Floor is a combination of many miles of easy terrain along roads and broad, gently sloping ridges, combined with three steep sections. It begins with the gradual climb up Tioga Pass Road to Gin Flat. 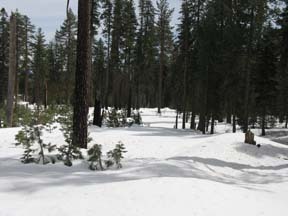 Then you follow Tamarack Campground Road as it winds through timber, rocks and small knobs. The next section follows very broad ridges to the point where the terrain finally becomes more difficult. The mileage log provides more details on this. But the crux of the tour is the navigation. Once you leave the security of the visible roads you must navigate along very broad, wooded ridges with no landmarks either nearby or in the distance. At the right point you must leave the ridge and tackle the ups and downs. While the mileage log will greatly facilitate reaching Devils Dance Floor, no guide will help you during whiteout or other poor weather conditions. The ridges are very broad and without landmarks navigation in foul weather is solely by dead-reckoning with compass — a difficult feat at best. You are urged not to attempt this tour if there is any chance that the weather will turn bad. Navigating the return trip from the peak can be close to impossible in bad weather. Regardless, why spend all the time and energy and not be able to enjoy the scenery from the summit. A final note about navigation. A GPS can certainly make navigation easier. However, you should never assume that your GPS is going to be your life-saver — there's lots that can go wrong with a piece of electronics. Continue of Tioga Pass Road for 2.7 miles until your reach the southwest end of Gin Flat (3), which is the first level area you will encounter after leaving the trailhead. At the southwest end of Gin Flat turn southeast (right) onto Tamarack Campground Road and follow it for 1.2 miles until you reach the location where the road exits the woods just east of Peak 7069 (4). This point is unmistakable. Although references are made to roads beyond this point, it is difficult to discern them. Do not plan on using them for navigation. Follow the road slightly south of east for 0.2 mile until you reach the location where you must consciously turn south (5). There is no landmark at this point. You have passed this point by a short distance if you find yourself descending on a narrow road that is not shown on the map. Turn south (right) and follow a very broad ridge south and then southeast for a total of 0.8 mile until you reach the location where you must turn south to continue on the ridge (6). There is no landmark at this point. The first part of this section is on a road though you will probably not be able to recognize it. Turn south (right) and follow the very broad ridge for 0.4 mile until you reach the location where the ridge drops abruptly (7). At this point you are in scattered timber and below in all directions the timber is more dense. Turn east (left) and descend the wooded slope for 0.3 mile until you reach a very small saddle (8). Climb southeast up a wooded slope for 0.2 mile until you reach more level and open terrain (9). Ski south through mostly open terrain for 0.2 mile until you reach a very small saddle at the base of Devils Dance Floor (10). Final climb to summit. Very small saddle is below and out of sight. The steepness of the climb is reduced in this image due to the use of a wide angle lens. Climb the very steep slope southeast through trees and boulders and then continue over gentle terrain for a total of 0.3 mile until you reach the summit of Devils Dance Floor (10). An alternate route over the steepest section follows the dotted line on the map. The alternate is especially welcome on the descent. 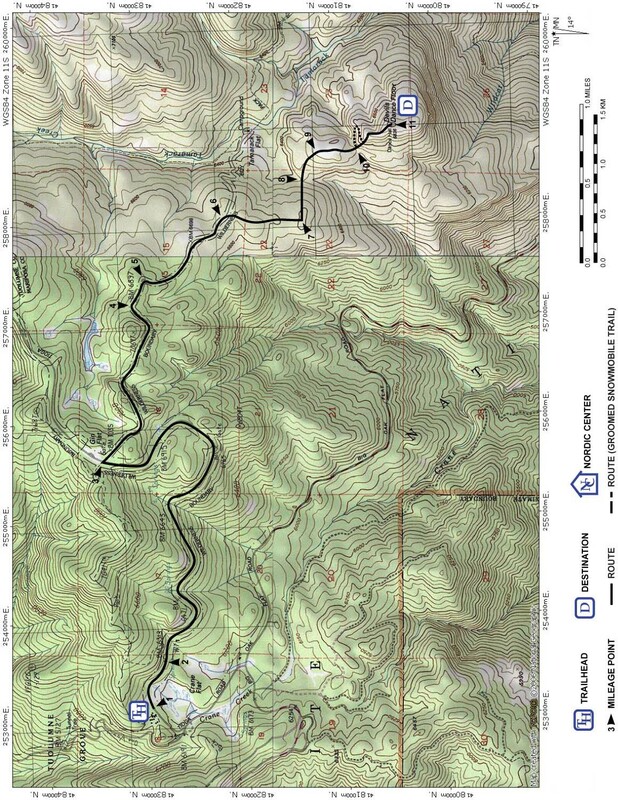 Retrace the route for 6.6 miles back to the trailhead (1).